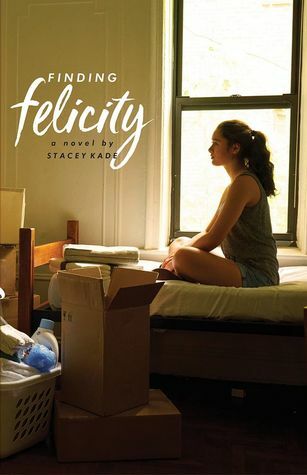 I have to thank Stacey for an advanced copy of Finding Felicity. I took it with me on spring break and enjoyed this wonderful story while basking in the sun. It has been a long winter in Ohio and this was a great way to kick off the spring/summer season. Caroline Sands is happier watching Netflix on her laptop than interacting with others. It is safe within the confines of her bedroom and there is no chance of rejection. The real world isn't so kind. She gets nervous around others and often stumbles upon her words. She wants to make friends and become part of the popular crowd, but she doesn't know how to go about it. When she leaves for college she is determined to play the part of various characters to make friends and attain the life she thinks she wants. When her plan doesn't go as she envisioned, she has to improvise. She always believed all of the other students had life figured out and she was the only one scrambling to stay afloat. She begins to realize everyone else is scrambling as well. They are just better at faking it. While she always thought she wanted to be part of the partying crowd, she soon discovers where she truly belongs. I thought this was a great story that any teen should read and would likely enjoy. Unless you are one of the few super popular kids at school, the grass always seems greener in someone else's shoes, but that rarely is the case. I enjoyed seeing Caroline take some risks and assert herself. It wasn't easy for her, but once she began establishing connections with some of the girls in her dorm she gained some confidence. She learned some valuable lessons and discovered who she really is and where she best fit in on campus. It has been several years since my college days, but I could relate to many of the events and found certain scenes to be ridiculously funny. If you are looking for a fun summer read, I would look no further. Have you ever seen the show Felicity! It’s so amazing! Need to read this book already! I have been a huge fan since the beginning. I didn't watch the show until recently. I'm currently on the 10th episode. (They just celebrated Thanksgiving in the dorm.) I absolutely love it so far and can't believe I never watched it until now. I hope you enjoy the book!